In our presbytery, one of the fastest growing demographics is the Hispanic population. Here are just a few phrases that anyone can use to help a Spanish speaking guest feel welcome. (See No One Said Hello for a Spanish speaking visitor who didn’t feel welcome). 1. “Dios le bendiga” with a handshake is a common greeting to one individual. “Dios les bendiga” would be used for a family or more than one person. It’s equivalent to “God bless you.” This is usually the first thing I hear. You don’t have to speak proficient Spanish to welcome the guest. But at least a greeting with a smile and handshake is one way to demonstrate hospitality. If you have some Spanish speakers in your congregation, try to introduce your guests to them. In the international church where I was associate pastor, helping people connect with others from their country of origin or language group was a vital form of hospitality. In the Spanish church our family attends, country of origin is a point of national pride and relational connection. When we welcome our guests during the service, we invite them to share what country they are from. At the end of the service, our members from that country are quick to welcome our guests one on one. When we first began attending there, one member welcomed us in in English since he can speak both languages. I learned quickly that he was from Venezuela. 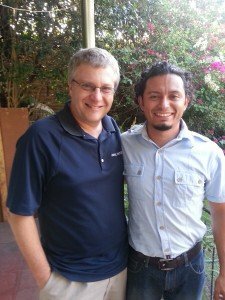 Because I have made several mission trips to Venezeula, that commonality helped the two of us connect. That welcome in my language, and that connection to Venezuela was a vital part of our welcome into that church. Would you take a risk and greet a visitor who speaks a different language?